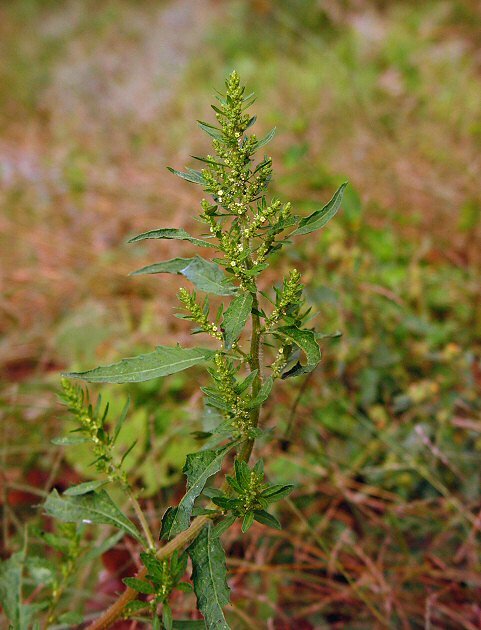 Dysphania ambrosioides is an annual C3 herb (Jacobs 2001), to short-perennial from a long fleshy taproot; unpleasantly aromatic, stem to 1 m, finely ribbed, erect, usually hairless but often white waxy-mealy, often much branched. Dysphania ambrosioides leaves. commons.wikimedia.org (Accessed 1/2018). Leaves narrowly egg-shaped, to 12 cm long, with large regular teeth, pointed at both ends, dotted with tiny translucent glands below (use lens), upper leaves, usually less toothed, becoming much smaller. 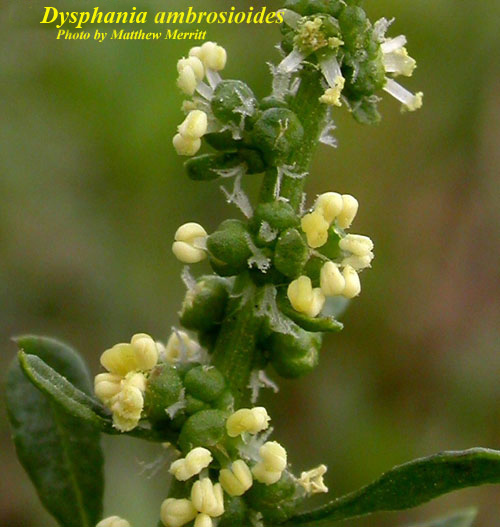 Dysphania ambrosioides flowers. Photo by Matthew Merritt. Atlas of Florida plants. © 2018 Institute for Systematic Botany. floridaplantatlas.usf.edu (Accessed 1/2018). Flowers tiny, greenish, stalkless, in dense rounded clusters along numerous slender, leafy spikes along upper branches; blooming and fruiting Aug.-Nov.
Dysphania ambrosioides fruit. By Gerry Carr. Copyright © 2018 Gerry Carr. Oregon Flora Image Project – www.botany.hawaii.edu/faculty/carr/ofp/ofp_ index (Accessed 1/2018). 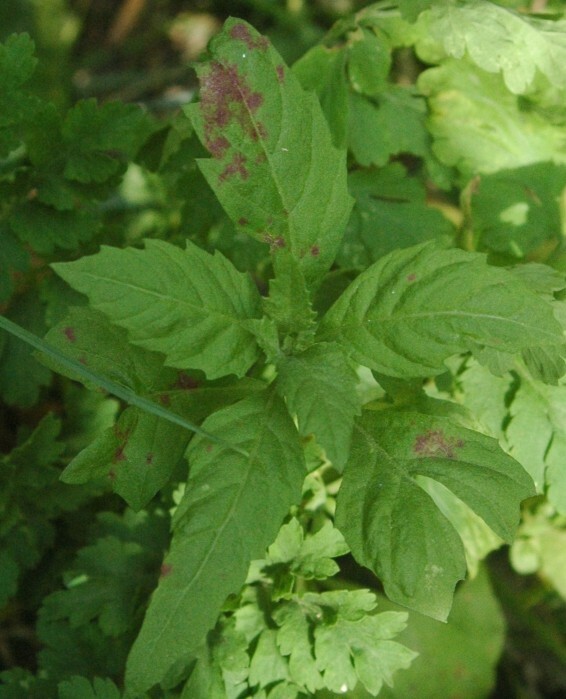 Fruit dry, 1-seeded, seeds dark brown, shiny, to 0.1 cm wide, mostly horizontal, sometimes erect. Seeds eaten by many birds and small mammals (Martin et al. 1951). Habitat: Open, disturbed areas, roadsides, vacant lots. Notes: Used as a potherb to flavor beans (epazote). Previously listed in the US Pharmacopoeia as a partial (preliminary) treatment for intestinal parasites. The oil from seeds contains a highly toxic, oily terpene ascaridol (Kingsbury 1964; Russell et al. 1997).